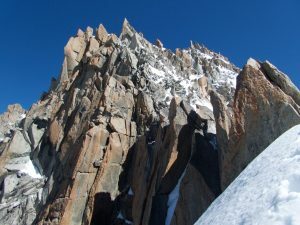 The Aiguille Verte is a misnomer: it is neither particularly needle-like nor green. Rather, it is a prominent golden wedge at the intersection of three needled ridges, which descend to the west, south, and east to the Drus, the Moine, and the Droites. The peak was first climbed by Whymper and his Swiss guides in 1865, via a couloir leading just east of the summit. 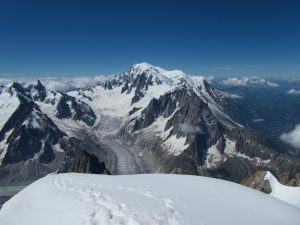 The Moine Ridge was climbed shortly thereafter, by local French guides. 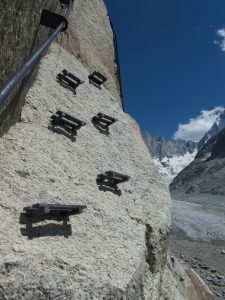 Global warming makes couloir routes increasingly questionable in summer, most are funnels for rockfall later in the day, and they often require front-pointing, hence boots. For all these reasons, I chose to tackle the Verte via the Moine ridge, rated AD with rock to III (5.4). I brought my light-and-fast setup of one alpine tool, trail runners, and crampons. I did not end up using the crampons, though I could have in several places where I had to engage in gymnastics and step-cutting to deal with hard snow and ice. The ridge felt close to the limit of what I would want to attempt with this setup. 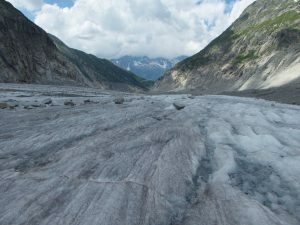 It also took longer than I expected, thanks in part to slow travel up the Mer de Glace, the lower part of which is more of a “Mer des Pierres” these days. I actually got something like a real Alpine start this time, heading out from the dirtbag parking in Chamonix at 3:30, following the signs up the trail paralleling the cog-rail to Montenvers. I was startled just above the parking lot by a young malamute-ish dog joining me. It was wearing a collar, so it seemed to belong to someone, but it did not seem particularly loyal, staying with me and keeping a lookout in the dark all the way to Montenvers, 1h30 or so into the day. It was still dark as I wandered past the rail station, hotel, and bar, nearly stumbling over a climber bivying on the patio. 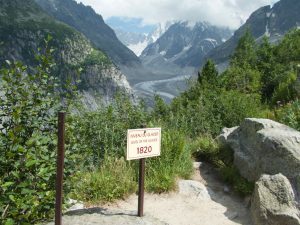 Just beyond the last of the tourist outpost, I passed a sign showing the level of the Mer de Glace glacier in 1820. 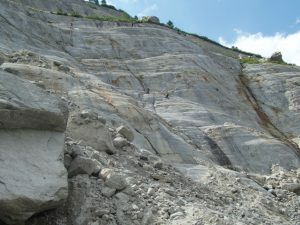 Since then, its level has dropped something like a couple hundred yards, exposing steep, polished slabs on either side. In a very European response to this problem, someone (guides?) has installed wild, Doctor Seuss-worthy series of bolted ladders, platforms, steps, and hand-rails to descend to the glacier. The ones at Montenvers are fairly tame, with two parallel lines to accommodate up- and down-traffic. 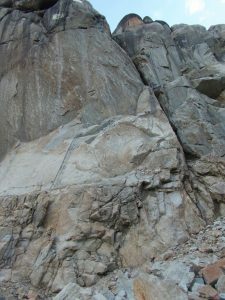 The ones up to the Couvercle are a bit wilder, with some sections completely vertical, and the rungs sometimes close enough to the rock to make them tricky to stand on. It was just growing light when I reached the moraine, and I saw a few headlamps on the Aiguilles, including two half-way up the Drus. The glacier moves enough to prevent a path forming, but I followed intermittent cairns southward, sticking to the moraines to avoid the slick, bare glacial ice, which was too slick this early in the morning. It had been t-shirt weather up to Montenvers, but it was cold enough down on the ice cube to need an overshirt and gloves. I lost the trail somewhere below the Leschaux Glacier, and made my slow way up the loose moraine to the left. 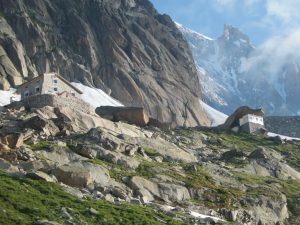 I saw two climbers making their way down the long ladders from the Charpoua hut, base camp for the Drus. I eventually picked up the trail again, and followed the red-painted cairns until I could see the big white square painted on the cliffs above the ladders and what-not leading to the Couvercle. Though it is all bolted into the rock, this random collection of hardware felt as sketchy as anything I encountered on the ridge. Maybe I will get used to this sort of Euro-hardware. Above, a good trail leads to two huts, a big new one, and a smaller old one sheltering under a giant boulder. 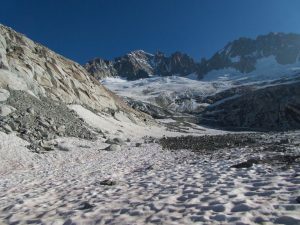 Below the huts, a trail marked with yellow wands descends to the Talèfre Glacier. While there turns out to be a better path above the hut, I did not know it at the time, so I followed the wands down onto the flat lower glacier. My guidebook mentioned crevasse problems on the glacier, but it was mostly straightforward. I bypassed the icefall on slabs and moraine to the left, then stayed left on softening snow until I joined the boot-pack from the hut, which climbs along the base of the Moine ridge to the Whymper Couloir, on the other side of the Verte. The entire ridge from the Moine to the Verte looks long and complicated. The so-called Moine Ridge route actually skips most of it, gaining the ridge on slabs and broken ground just past its last major gendarme, the Cardinal. There was a bit of sketchiness crossing from the glacier to the face, but I fortunately had a boot-pack to guide me around a crevasse, along a snow ridge next to the moat, then across a big step to a steep snow-chute from which one could final step onto the rock. Not wanting to deal with crampons, I cut a step to help myself get into the chute, then carefully followed the hard boot-holes. After so much ascent to reach the base, it seems like the ridge should be short, but the numbers don’t lie: it’s 800 meters from the moat crossing to the summit, slightly longer than the northwest ridge of Mount Sir Donald, and much more complicated. The first part is a wandering climb back toward the ridge, which can probably be kept to class 4, but ended up being class 5 in a few places. 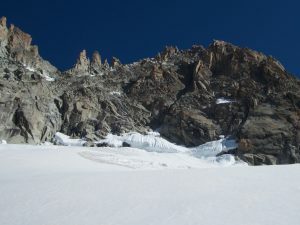 Above, the route stays below the ridge on some chossier rock, paralleling a couloir separating the main ridge from a subsidiary one, finally reaching the main ridge near where the two join. The route had been mostly snow-free to this point, but beyond, some snow became unavoidable. The boot-pack split, with one group taking a lower and snowier line, and another staying closer to the crest. Both seemed to be keeping their crampons on for both snow and rock. I do not like doing rock in crampons when it can be avoided, or wasting time taking them on and off. I am more comfortable working around or sketching through snow, an approach that worked in this case. The route-finding becomes somewhat simpler higher up, but is still not straightforward. The ridge is fairly narrow, but jagged enough that one cannot follow the crest, but must detour left or right to find the easiest path. This route-finding, and a mixture of fifth-class rock, slush, and hard snow, demanded constant attention, and was mentally taxing. I was disappointed by my slow progress, gauged off the neighboring Grande Rocheuse. There were some memorable passages, including a foot-traverse with no hands and an à cheval and/or hand traverse. The established boot-pack was often helpful on the snowy sections, but I had to improvise in places where its creators had used their crampons to climb rock-hard névé or ice. I finally emerged on the summit around 11:30, greeted by a moderate breeze and clear views in all directions. 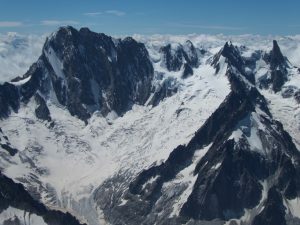 All morning, I had been admiring the north face of the Grandes Jorasses, probably the most impressive face the region. 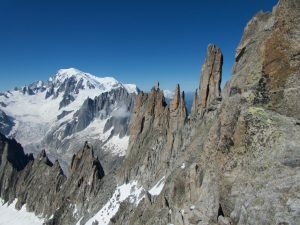 That and the neighboring Dent du Géant still drew most of my attention, but there were sharp spires and serrated ridges in most directions, plus the white dome of Mont Blanc to the southwest. There had been a helicopter making a wandering patrol all morning, seemingly checking in on my progress a couple of times. As I sat on the summit, I saw it nearly touch down on the Aiguille Sans Nom (toward the Drus), though I couldn’t tell if it plucked someone off. Mindful that the descent might be slower than the climb, I ate my sandwich quickly, then put on my gloves and began retracing my steps. I was tempted to go with crampons on the way down, but decided against them, since the snow had softened enough to make them not particularly useful most of the time. The descent was intense, but went mostly better and faster than expected. I did get off-route once, wasting some time looking for a downclimb on what may have been a rappel route, but was rewarded by finding someone’s Petzl Sum’Tec, a nice alpine tool and the successor to my own well-used Aztarex. Score! Once past the subsidiary ridge, things went more quickly on the ledges and slabs leading down to the moat. I even bashed my knee on a cairn, reminding me that I was on-route. The vicious thing might have been helpful, but I refused to repair it, lest it claim another victim. On my way up, I had seen a group of three making their way to the base of a nasty-looking garbage-chute leading to the Evéque, a pillar on the Moine Ridge. Now I saw them in the same place on their way down, and thought I might catch them on the glacier. Safely getting back off the rock took a bit of time, though, so they were out of sight by the time I was back on easy snow. I normally would have jogged the trail down, but my knee was still stiff from that nasty cairn, so I settled for hiking quickly. I stopped to switch into shorts and refill my water at a stream — we’ll know how clean it was in 4-5 days — then continued to the ladders. They should have been harder going down, but they felt about the same, so perhaps I am getting used to them. 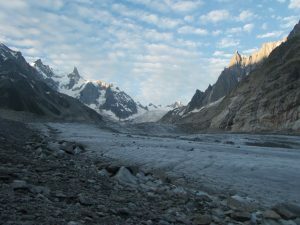 I saw several other parties on the Mer de Glace, from groups going to and from the hard routes on the Jorasses, to a guide or parent leading a kid across the moraine roped like a dog, to some hikers out for the day with trekking poles. I still couldn’t quite run on the trail down from Montenvers, but I at least managed a shuffling jog, passing plenty of day-hikers on my return to the car. At 13h35 and only 3h or so of mindless trail, it was a tough but not over-long day. This entry was posted in Europe, Type II fun. Bookmark the permalink.